In looking back at what I've done this quarter, 2 out of 4 completed projects isn't so bad. Especially when I realize that I created 2 additional quilt tops spontaneously: a St. Louis 16-patch, and a modern mega-block log cabin baby quilt. 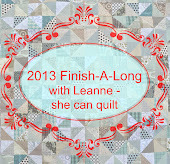 Both are just quilt tops currently, so you'll probably see them on my Q4 To DO list here in a few weeks. I have referred to this quilt by many names, and in fact it has had several layouts in the process of being laid out. When I began this quilt, I knew I wanted to work with half-square triangles, and wanted to include low volume fabrics contrasted with predominantly tone-on-tone or white-on-color gray and turquoise fabrics. But I was unsure of what actual design I wanted to make. You can see a previous post about this quilt here. Detail of the diamonds on the quilt top. I quilted this outlining the diamonds on both sides of the seams, and then quilted parallel lines in the border. The quilt is backed in Ana Davis' "Buds" fabric in turquoise for Blend Fabrics, and is bound in a fabric from my stash. Buds fabric in turquoise from Ana Davis' Spring Promise collection for Blend Fabrics. This is my SECOND finish for the Q3 Finish-A-Long, and has been listed for sale in my Etsy store.